Poe Dameron is a tank with the ability to expose enemies as well. We will be looking at what he offers compared to the rest of the characters. Basic Ability: Challenging Shot – Deal physical damage to target enemy with a 40% chance to inflict Offense Down for 2 Turns. This chance is doubled if the target is suffering any negative status effects. Unique Ability: Stand Firm – Poe has +35% Tenacity and recovers 7.5% of his Max Health whenever he resists a negative status effect. Leadership Skill: Ace of the Resistance – Resistance allies gain 25% Offense and 15% Potency. 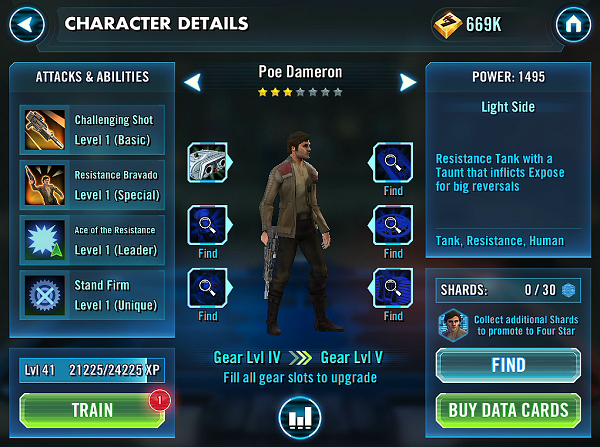 While Poe Dameron doesn’t have any strong heals as a tank, he is primarily built for offense. 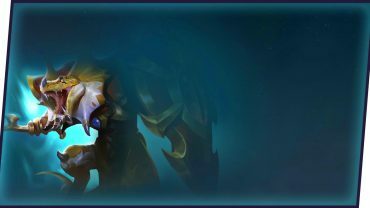 His 2 turn taunt comes with a chance to expose all enemies. Expose means the enemy loses 20% health on the next attack , allowing AoE skills to deal more damage. Therefore, he is best paired with AoE damage characters like IG-88, HK-47, Captain Phasma, Kylo Ren, Jedi Anakin. Lando, Darth Sidious, Ugnaught, Kit Fisto, Underworld Police, Boba Fett, Jedi Knight Guardian, Darth Vader, Dathcha, Jawa, Snowtrooper, Clone Sergeant and more. His only glaring weakness that his 2 turn taunt will often put him at red health. It is dangerous to taunt a team full of offensive units. He will get destroyed unless you have a good healer to keep him healthy. He is very useful in the arena to soak up damage as long as you have 2 decent healers. Verdict: Only max him after your core characters(JC, Talia) unless you want him exclusively for the arena.